Joe Canning of Galway in action during the GAA Hurling All-Ireland Senior Championship Final. Was that the All-Ireland epic to end all hurling seasons (sorry to be churlish) anything but? Was it a fittingly manic, magical injury-time conclusion to the best summer of small ball ever? Beyond question, yes, and for that we should be grateful. But there are some minor book-keeping issues to sign off on before this column’s concentration turns fully to Sunday week’s football decider between the Dubs and Tyrone. (1) Joe Canning (Galway): For the second year running, we beg to differ with the unanimous verdict of The Sunday Game crew. Last year they plumped for Gearóid McInerney; we favoured Waterford’s Jamie Barron whereas the ultimate award, as voted by the players, actually went to Galway’s perennial talisman, Joe Canning. This year the RTÉ experts all opted for Padraic Mannion, who was our marginal pick ahead of Sunday’s final but we find it impossible to ignore Canning’s Herculean second half, coming on top of his profound influence in the Kilkenny replay and both days against Clare. More deserving than last year, we venture, even in defeat. 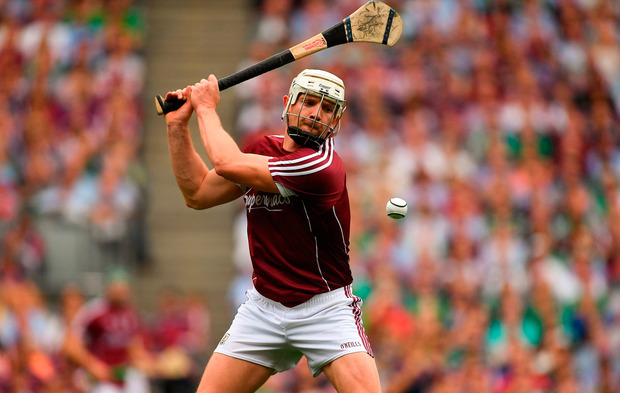 (2) Padraic Mannion (Galway): A font of defensive excellence, full of dynamism and dash. Not a bad final either; just not quite as brilliant as what went before. (3) Declan Hannon (Limerick): No Treaty man until No 3, surely some mistake? Maybe that tells you even more about how theirs was the ultimate team success. They had so many different players contributing at key stages of massive games. How about Cian Lynch, a relocated midfield wizard who carries a stick for a wand? Or their sniping inside raider, Graeme Mulcahy? But our choice is Hannon, a leader in far more ways than being the man who lifted Liam after all those years. He was toweringly good when it mattered most, against Cork and then Galway. Honourable Mention: John Conlon of Clare. What a warrior. What a summer. (1) Kyle Hayes (Limerick): The 20-year-old saved his best ‘til last with a Man of the Match performance on the biggest day. (2) Darragh Fitzgibbon (Cork): An athlete with skill to burn. Looks primed for a deserved All Star, alongside Lynch at midfield. Shane O’Donnell’s waltz past a trio of maroon jerseys to kickstart Clare’s second-half revival against Galway in their semi-final replay. We appreciate the technical brilliance, and incredible reflexes, shown by Kilkenny’s Eoin Murphy to deny Limerick duo Aaron Gillane and Gearóid Hegarty (at the expense of a point each time). But we find it impossible to overlook Limerick’s Nickie Quaid for that save against Cork’s Seamus Harnedy. More goal-stopping flick than save but without that inspired dispossession, Limerick would not be champions. It has to be Peter Duggan of Clare for his jaw-dropping piece of control and point off his stick on day one against Galway. The Limerick/Cork semi-final. For our money, it eclipses the previous day’s deadlock between Galway and Clare.